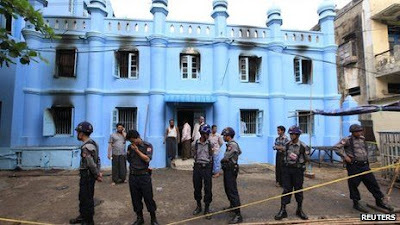 A fire at a Muslim school, part of mosque, in the Burmese city of Rangoon has killed 13 children, officials say. The school sheltering some 75 orphans comes amid an upsurge in violence between Buddhists and Muslims. Police officers said the fire was caused by an electrical fault and not due to any criminal activity. Most of the children escaped unharmed.